Most out-of-towners know Austin as the home of great barbecue, weirdos, festivals, and Longhorns loyalists. What they might not realize, though, is that we locals spend way too much time in our cars, whether it’s a Prius or a pickup. For us, spending an afternoon staring out at the congestion on a construction-blocked I-35 is a fact of life, as miserably inevitable as stubbed toes and tax season. Other than isolation and air pollution, Austin’s car culture has fostered tons of gas-station restaurants with food of every variety and description. Here are our 10 favorite places in this highway-wrapped city to fuel up while fueling up. Drive safe, and dig in! 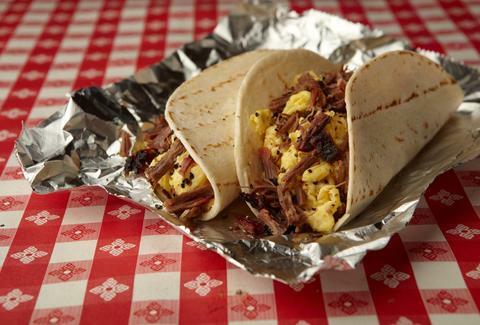 Rudy’s epitomizes the cultural power of gas-station dining in Texas. 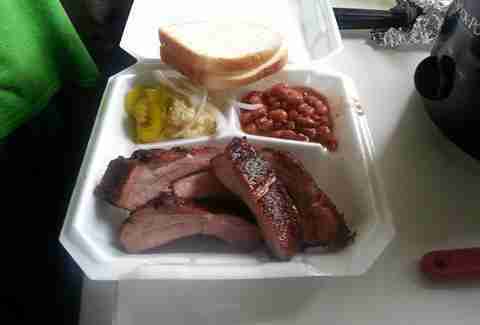 Starting out as a mini-mart/barbecue shack on the side of the highway, it now has multiple locations throughout the Southwest, all selling the same reliably tender brisket smeared with syrupy BBQ sauce. You can still fill your tank, too, although prices have increased considerably since Rudy opened that grocery store in 1929. With its charmless fluorescent-drenched atmosphere and aisles of beef jerky and Takis, JD’s is pretty much the prototypical gas station restaurant. That said, the Mexican lunch counter at the back is also a prime example of the kind of culinary oasis you can stumble across if you run out of gas at the right time. It doesn’t look like much from the outside, but good lord, the carnitas alone are worth pulling over for. Pro tip: Get them on a soft white bun, have them wrapped, and allow a little time for the flavors to settle and meld. This unassuming little food truck in a Gulf Gas Station parking lot serves up elaborately marinated meats of all varieties, in gordita, taco, or quesadilla form. Everything is crisped up on the ancient, beloved griddle, and laced with mild white cheese if you ask for it (you should). Taqueria Mi Trailita boasts the virtues of being vegetarian-friendly, super-cheap, and open till midnight (1am on Saturdays), making it a great stop for a quesadilla run to cap off a night on the town -- with a designated driver, of course. Pretty much every gas station in Austin will sell you breakfast tacos of one kind or another, whether they’re steam-table beauties with rubbery eggs or a couple of aluminum-foil pods pulled out of the bottom of a freezer and microwaved at your “convenience.” Save yourself the pain of a mediocre taco and go straight to Tierra Linda, the best gasser for breakfast tacos in town. The chorizo, egg, and potato is a favorite: fluffy eggs are studded with potatoes and crunchy little striations of chorizo, topped off with some creamy, spicy avocado salsa. These folks don’t mess around -- seriously, they make their own tortillas! Texas isn’t exactly known for its pizza, but Giovanni’s does a pretty damn good job, especially considering it’s located inside a Valero. The pizzas are freshly made with a pillowy dough that forms a crispy crust, and whether you go with the pared-down Margherita, or the Greek pizza with olives, spinach, and feta, the toppings here are always spot on. 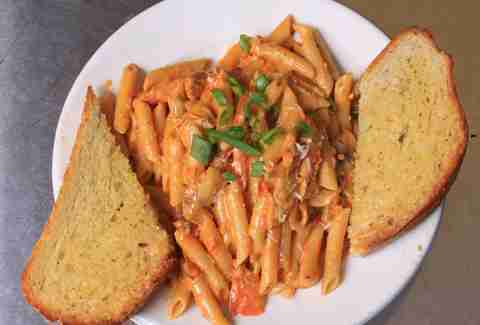 The pasta is what really stands out, though, particularly the penne arrabbiata with chipotle peppers in spicy tomato sauce -- it’s the Tex-Italian combo you never knew you needed. Hidden inside a nondescript mini-mart, Chicken Lollypop is home to some of Austin’s most unique Indo-Chinese food, with the added bonus of offering tons of options for your vegetarian passengers. Its overloaded naan wraps, tongue-tingling chili paneer fried rice, and the titular chicken lollypop -- spicy tandoori chicken with a sticky burnt glaze -- are all well worth a detour. If you’re a vegan, it’s a little harder to find top-notch gas station comestibles, as nearly every taco truck you might pop into is meat-focused -- even the beans in most burritos are usually cooked with lard. Fortunately, plausible deniability isn’t your only option! 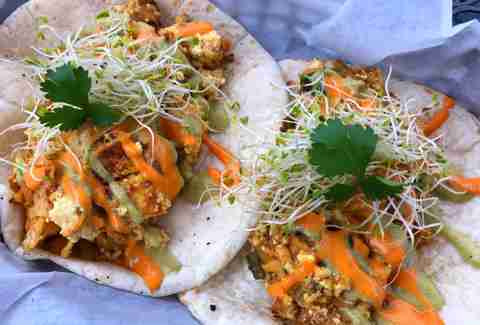 The Vegan Nom is here to save the day with its full menu of vegan tacos, including a variety of tofu scrambles, served all day. There’s nothing remotely glamorous about El Norteño, a grimy-looking white truck tucked into a nook in the back of the parking lot of a Texaco station. What it lacks in glamour, though, it makes up for with the greatest al pastor known to man, rotating on a spit with a big hunk of pineapple on top. You can’t ask for much more than that. If you’re a vegetarian at Jr’s, you’re pretty much screwed. 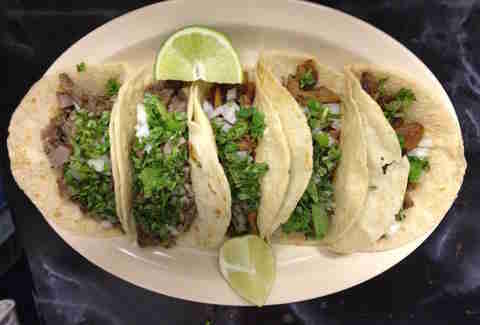 For carnivores, though, this place is the answer to your gas-station Mexican food prayers. It has a full menu beyond tacos, including killer chicken enchiladas and breakfast burritos the size of a small child. Plus, the spicy, garlicky, and creamy homemade green sauce is the stuff breath-ruining dreams are made of. If you’ve already spent a ton of time in your car, why not get some barbecue and fulfill two Austin stereotypes at once? Kinfolk’s brisket is the most underrated in town, slow-smoked in the old-fashioned style until it gets a thick charred crust, an aspect of Texas BBQ neglected by fancier joints that focus on slow melting fat and supple tenderness over the less elegant heft and chaw of a crusty end slice. 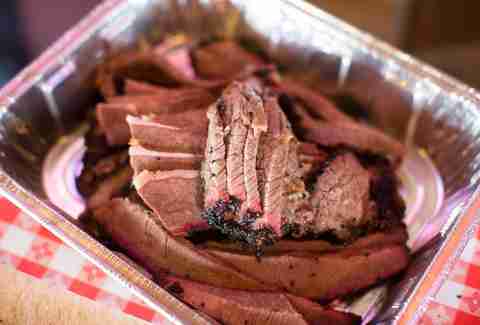 This place is bare-bones delicious and, if you call ahead, it’ll pack up enough some of that delectably smoked brisket to feed a small army in the time it takes you to fill your tank. Emily Beyda is a taco enthusiast currently based in Austin. She is the proud owner of three chickens named Hildegarde Von Bingen, Louisa May Alcott, and Sandwitches.